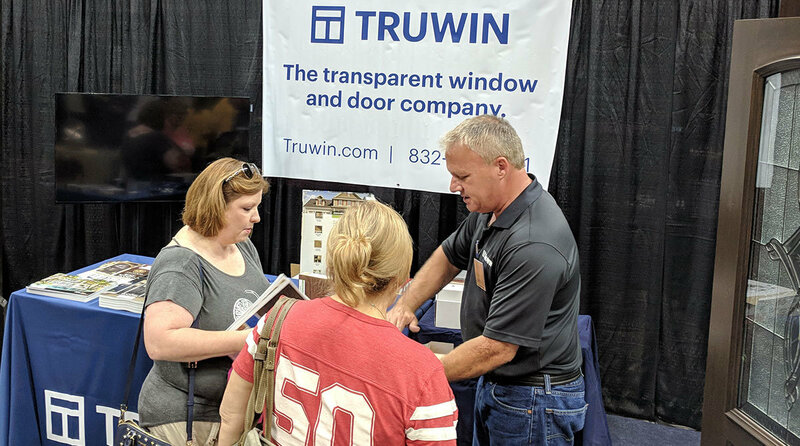 Truwin Enterprises participated in yet another successful Katy Home & Garden show. We displayed our beautiful wrought iron, solid wood and premium fiberglass doors, along with James Hardie siding. We spoke with numerous homeowners regarding the unique aspects of each of their upcoming projects and offered creative solutions for better windows, doors and siding. Uncovering why the project is being considered and what’s important helps us decide which product or products will provide the best fit. Next, we help the customer compare several brands and options with displays, samples and written documentation. Unlike many contractors, we believe one window, one door and one brand of siding does not fit every home or customer. We also discuss important details such as installation and who their crew will be if they decide to move forward. A concise history of our experienced staff and company also help homeowners with the trust factor needed to feel confident in their decision. Come visit us Oct 20-21 at the 2018 Texas Home & Garden Show held at NRG Center and again on Jan 26-27 (The weekend between playoffs and Super Bowl) at the 2019 Katy show. For FREE tickets, please call our main number (832)777-3681 and/or email Jay@Truwin.com for seasonal and home show special promotions.